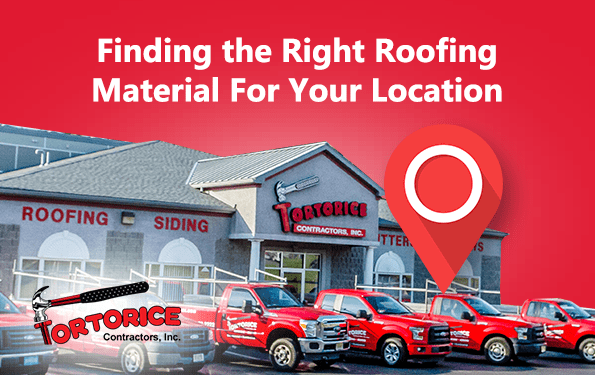 NJ Roofing Contractor: Choosing a Roofer Material That Suits Your Location - Tortorice Contractors Inc.
A good NJ roofing company will tell any homeowner that investing in a good roofing material will help protect their property and loved ones from harmful elements. However, there are many different materials available and not all of them are suited for the same location, temperature, or weather. The right choice in roofing material can help save you time and future headaches. Here are some tips on how to choose the right roofing materials according to your location. If you live in an area with high amounts of precipitation, you need something that won’t become damaged easily due to rot, mildew, or mold. For people living in tropical or humid locations, algae growth is also a concern. This is why a good roofing company from NJ will recommend that the roofing material you choose should not only be weatherproof but algae resistant as well. A good choice for this type of weather and climate is metal roofing. Metal roofing is very durable and lightweight. It can withstand constant rains and algae growth and is very easy to maintain. Aside from this, it also helps to protect your roof from rot, mildew, and mold damage. However, you do need to watch out for rusting which can damage your metal roof. Make sure that the roof is treated so that it will last longer. Another good choice for a tropical climate and warm weather location is asphalt shingles. They are affordable and easy to install. For tropical or humid locations, NJ roofing firms recommend the application of algaecides to prevent algae growth and extend the durability of your roof. Clay tiles also do well in humid and wet locations. Many roofing companies from NJ do not recommend that they be used in areas that see a lot of snowfall because they can split and crack easily. They are also heavy which can cause damage to your roof with the additional weight of the snow. However, clay tiles are very durable and last a long time when installed in homes located in tropical locations or areas with warm weather. Slate is a good and versatile roofing material. It is a material that does well in areas that see all four seasons. While it is very expensive, it is also very durable. It is recyclable and easy to repair. Slate has a darker color though so it is not often recommended by NJ roofing contractors for areas with high temperatures. Wooden shingles and shakes are also recommended for cold weather or low temperature areas. They do not split or crack and are very lightweight which is good if you live in an area with abundant snowfall. It is advised by roofing companies in NJ that you check your roof for rot and decay periodically. Fortunately, wooden shingles and shakes are affordable and can be replaced easily. They are also eco-friendly and there are manufacturers that create them with sustainable materials. Asphalt shingles are also a good choice for cold locations and climates. However, they have a low insulation value. If you intend to ask your NJ roofing company to install this type of roofing, make sure to inspect your roof periodically because this type tends to crack and split in cold weather. Metal roofing is also a good choice for homes that experience all four seasons. It can keep your house cool in the summer and warm in the winter. Metal roofing materials can be made to look like traditional roof coverings such as shingles and tiles. This type of material has high insulation solar reflectance and can be made with recycled materials. You can also often choose the type of material for your metal roof. You can opt for aluminum, copper, or stainless steel. Many NJ based roofing companies recommend metal roofs to be both water and rust proofed to extend their longevity to up to 75 years. Another good choice for cold weather locations is fiber cement. This material is a mixture of concrete, clay, and wood fiber. According to roofing companies in NJ, this type of material is very durable, comes in a variety of colors, and is suitable for many different types of architectural designs. Fiber cement is not as heavy as cement tiles so it does not require too much reinforcement. They do tend to crack in cold weather but should be reasonably durable as long as you don’t step on them. You should discuss the type of roofing material you want to install with your NJ roofing contractor. The roofing you choose should be suitable not only for your architectural style but also for your location and climate too. Roofs need to be durable and able to withstand different kinds of weather that your location could encounter. The right kind of roof will not only protect your house from different weather elements but will also keep you from breaking the bank.